Bringing relaxation and rejuvenation right where you are! - Then Chair Massage is the perfect match! 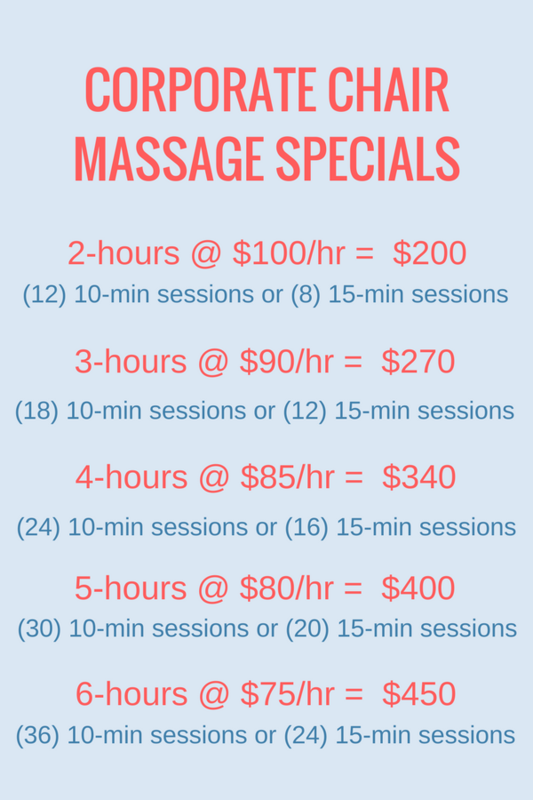 A unique and affordable service that lets you enjoy the benefits of a therapeutic touch without taking a large bite out of your day. It is a great way to show appreciation to others, as well as promote your business or event. - A brief massage done while sitting in a specially designed portable massage chair that generally lasts from 5 - 30 minutes. Chair massage is performed through the clothing typically addressing the head, neck, shoulders, back, arms and hands using no oil. 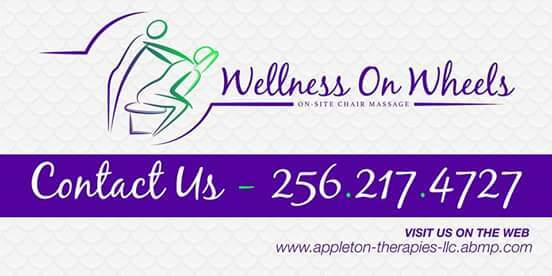 Let Appleton Therapies take the stress out of bringing Chair Massage to your office or event. We provide on-site chair massages that relieve tension, relax the mind, and leave everyone ready to work! Our team is happy to create a custom quote for you. REQUEST A QUOTE. Complete form and all sections that apply to you. If you're unsure about an answer, no worries, we can help with that too! *Rates listed are per hour, per therapist. Full risk management compliance, transportation to/from site/event, equipment setup/breakdown, professional massage chair, licensed/insured massage therapist(s), aromatherapy (optional) and relaxing music (optional). There are no additional fees or taxes except for areas outside of 25 mile radius of Appleton Therapies LLC zip code (35801) or certain types of facilities such as hotels, hospitals and convention centers (depending on job volume). Chair massage rates vary depending on a number of factors, including type of event, location and the number of therapists required. Generally we accommodate 4-6 people per hour, per chair, depending on session time. We recommend using at least two (2) therapists for jobs requiring more than 4 total chair massage hours. Please contact us to discuss your specific needs or for more information.